"A love story of today's love and laughter." Producer David O. Selznick's lavish film was an attempt to outdo his previous classic epic, Best Picture winner Gone With the Wind (1939), and it was his first production since his other Best Picture Oscar winner Rebecca (1940). Director John Cromwell's epic, three-hour work, with a screenplay by Selznick himself, was based on Margaret Buell Wilder's novel, composed of a series of letters from a wife to her at-war husband. Nine Oscar nominations were awarded to the film, with only one win - Max Steiner's Best Score (Steiner's third career Oscar). The other nominations were: Best Picture, Best Actress (Claudette Colbert), Best Supporting Actor (Monty Woolley), Best Supporting Actress (Jennifer Jones), Best B/W Cinematography (Stanley Cortez and Lee Garmes), Best B/W Interior Decoration, Best Film Editing, and Best Special Effects. The soap-operish, tear-jerking film begins with a written introduction: "This is a story of the Unconquerable Fortress - the American Home...1943." 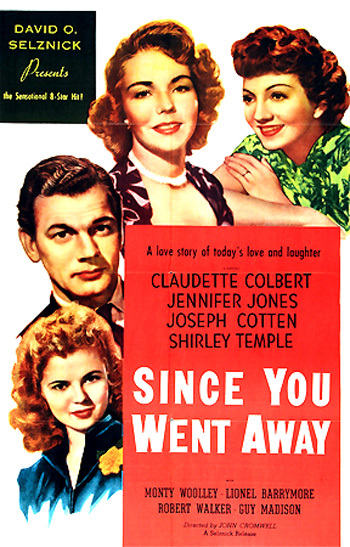 When her husband goes off to World War II, Anne Hilton (Claudette Colbert) is left behind with her two daughters, Jane Hilton (Selznick's own protege Jennifer Jones) and Bridget or 'Brig' (Shirley Temple), the family maid Fidelia (Hattie McDaniel), and elderly boarder Col. Smollett (Monty Woolley). A bachelor Lt. Tony Willett (Joseph Cotten), who has always been in love with Anne, shows her attention while her husband is absent. In its most memorable scene, recently-engaged girlfriend, Jane experiences a heart-rending parting at the railroad station with her young fianceé Corporal William G. Smollett ("Bill") (Robert Walker, Jennifer Jones' real-life, soon-to-be estranged husband), who is being transported to the warfront. They exchange a class ring and watch, and as the midnight train pulls away, she runs alongside the train talking and shouting the heart-wrenching, "I love you, darling," until it is no longer possible to keep up.